please give a detailed description of your characters appearance or give a picture. Hey, let me know if this bio is alright. Species: Not technically a real person, yet he isn't a full Nobody or Heartless. Ansem created him by attemtping to try to create a new heart for a Heartless, and he was born. Keyblade: Solar Dawn and Lunar Dusk. Personality: While tending to work and act alone, he wants friends deep down, but choses to stay away from others out of fear from how they're react to what he is. Crush: None as of now. Appearence: His black spikey hair usually covers one eye. He has piercing blue eyes. He has a long sleeved black shirt with a black and grey light vest over it. He has black pants. He keeps his Keyblades in sheathes on his back. approved! Welcome to Ultimate Kingdom Hearts! I will be your Rival. Your alliance will be "Light"
and because you're the first person to join i'm gonna make you a moderator! Alright, thank you. You're going to be my rival? Sweet. I'll double check what a moderator does. if i decide to, i could make you an Admin. Or i couldn't. I'm still deciding. Personality: Sarcastic, Fist-Happy, somewhat Random. 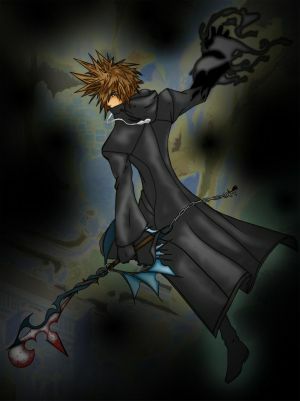 Keyblade: Wait, why would a Nobody other than Roxas have a Keyblade? Should I have a different weapon? Crush: None - Void of emotion, remember? Did you make Virus specifically to counter Plague? I kinda have a new character idea. Rival: I was thinking maybe my own character or someone elses. Personality: Hardened by battle at an early age, he has a very serious personality and is always gearing up for a fight. He would do anything to protect the worlds and the gate to Kingdom Hearts. Crush: None as there are no female characters yet. Appearence: He has platinum blond hair. He has piecring silver eyes that almost make his eyes look all white, with a large scar running down the right side of his face. He has on a white-silver shirt that has an armored chest plate with a heart symbol on it, armor pieces on his arms and kness, and darker silver pants. On his shoes are small wheels, which allows him to go faster then normal. Well, okay. What do I owe you? You sure it's alright? Personality: Keeps to him self, only speaks when he feels the need to, and can seem shy when truly he is in deep thought. He can't control his unusual powers yet, and must maintain his emotions in order to do so. Appearance: Blue hair, and extremely dark blue eyes. He is tall, and wears a long silverish blackish jacket, and black pants, both too big for him. These cover odd blue markings on him. Alliance: Blaxek, accompanies him wherever he goes. Personality: Very outgoing, speaks whats on her mind, and doesn't care what eanyone thinks about it. Shes looking for a heart with Blaxek, as they used to be brother and sister, but she was turned into a heartless, and therefore a nobody. Appearance: Short pink hair, wears a white and pink skimy one piece skirt. Deep green eyes that seem blue at sometimes. Both are approved. We don't seem to have any other characters for their rivals, so they'll both be Friendly Rivals. Know it's kinda asking a lot, but I sort of want to also RP as a member of the new Organization. I know every character has a rival, but it could be he hunts down Rapier for leaving the group. Personality: Very apocaliptic. Likes to create chaos. Has a cold and cruel personality, although he has a happy sadistic tone most of the tone. 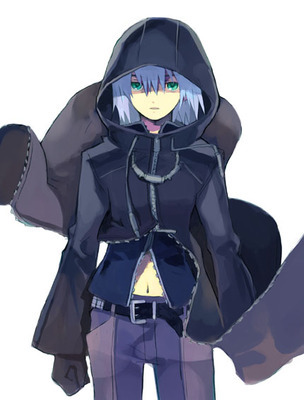 Appearance: Like all Organization members, he has a black cloak with a hood. He has very dark blond hair [almost black], piercing blue eyes, and glasses with spikes on the rims and around the lenses. So, is he alright? If not, I'll live. yeah sure. No rival, alliance: Nobodies.